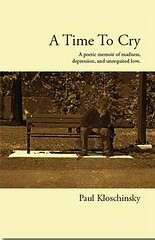 Fans of Bob Dylan will rejoice at discovering Paul Kloschinsky. His songwriting style is much like Dylan’s though vocally, I’d choose Paul. At times, though, on songs like All I’m Hopin’ For, you may think you are listening to a young Dylan. The song Wearin’ Blue won him the MusicAid award for songwriting in 2007 in Canada as well as being a semi-finalist in a UK songwriting contest. Good folk songs are more like poetry than most songs, and Paul knows that, and with Woodlands he creates a more than listenable album. Some stand out tracks besides the award winning Wearin’ Blue are In My Mind, All I’m Hopin’ For and the Gordon Lightfoot-esque Like Nothin’ Before. Also, like Dylan and Lightfoot, Kloschinsky doesn’t have a perfect voice. At times its very gravely, but it provides character to the songs he’s singing. This may not be for everyone, as those kinds of voices are an acquired taste. Besides being a talented songwriter and performer, Kloschinsky also shot the photography for the cover art. Pretty impressive!